on a grassy patch overlooking del mar beach. tons of people (adults and children). so many beautiful stories about max. tables filled with legos for the kids. a fly by with two vintage WWIIi aircraft. a raptor, that flew in. truly an amazing celebration of a little boy's life, who has touched so many. i took tons of photos for the mikulak family. this one was the last...a photo of a tree at max's school. 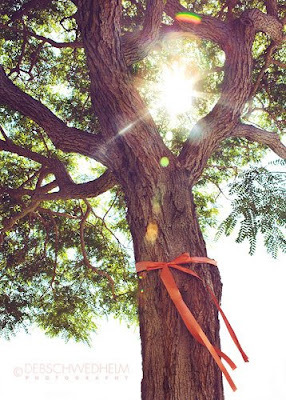 every tree surrounding the school has an orange ribbon tied around it. i hope to post many more photos over the next few days of the beautiful celebration and i will also be photographing tomorrow's 5-mile walk, for the magic water project. i know this blog has had many followers and i hope that sharing the celebration of max's life and it's beauty will help offer a closure of some sort for all. thank you for all the wonderful support and encouragement throughout. Thank you Deb. Your photographs are truly amazing.